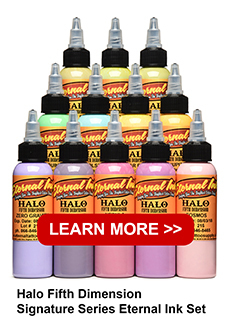 To freehand a tattoo takes artistic ability and confidence and both can be seen immediately in the tattoo art of Halo. He begins with a marker sketch directly on the skin before inking color with his machine. Halo is primarily a portrait artist. His style is based in color realism with a talent for mixing styles. His tattoo art is saturated with color … all blended with a true artist’s understanding of value and hue to create eye-popping images with sensitivity and impact. Apprenticed in the craft at his start, Halo worked his way to success. 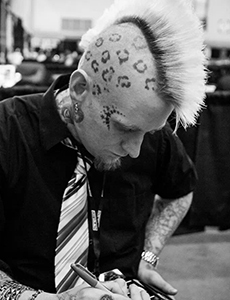 Halo exploded onto the national tattoo scene, in part, by his talented run on Spike TVs’ Inkmaster program. I like analyzing colors, trying to understand contrast shifts, muting and activating colors, and tonal differences.